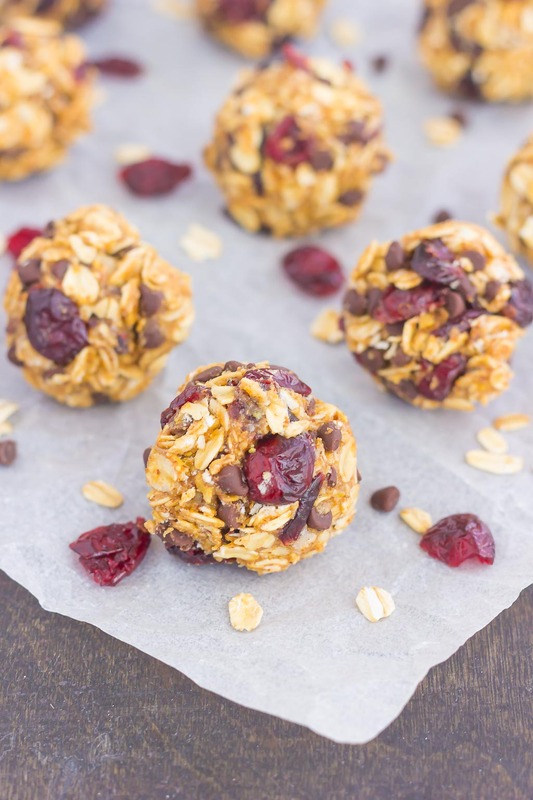 These Cherry Chocolate Chip Energy Bites are a simple, no-bake treat, filled with healthier ingredients and loaded with flavor. Perfect for a quick breakfast, snack, or even dessert, you’ll be whipping up these bites all year long! I couldn’t let February go by without sharing some energy bites, friends! 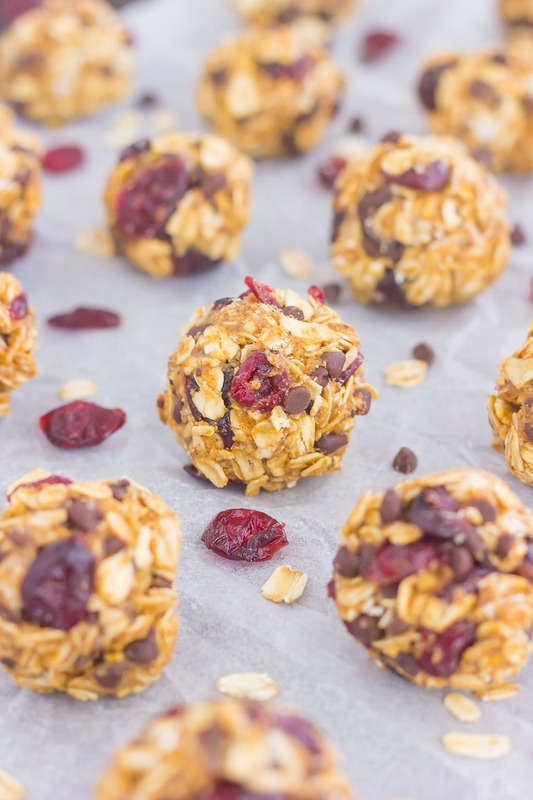 I’ve been living off these Cherry Chocolate Chip Energy Bites for a few weeks now, and it’s about time I share this recipe. Sound good? But, before we get to the fun stuff, how is your year going so far? Are you sticking to those New Year’s resolutions? Do you even make resolutions? I’ve mentioned this before, but resolutions and I don’t mix. I usually end up sticking to my resolution for a short time, and then it’s a big, fat fail. That’s why I like goals better. I always set goals for myself, whether it be teeny tiny goals, like organizing a kitchen cabinet, daily goals (I love checking off my to-do list! ), and big goals. Goals are much more achievable for me than resolutions, and are 99% more likely to get done. 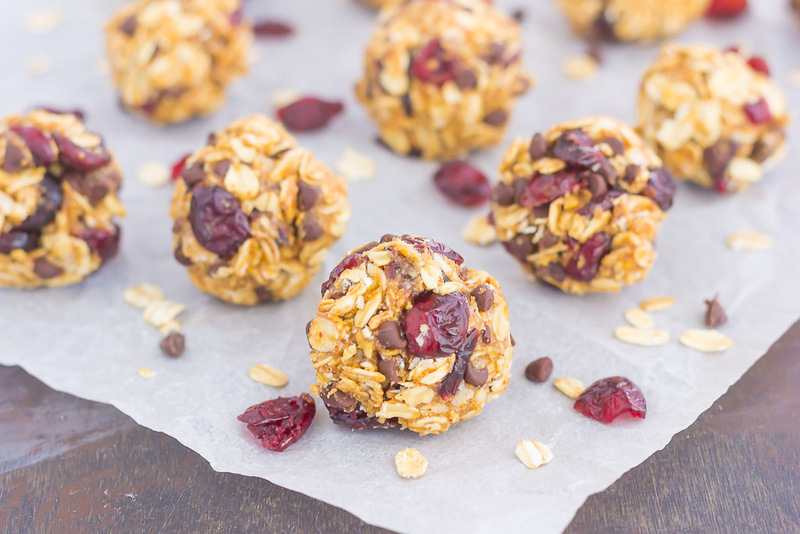 And my goal for today is share how easy and oh-so delicious Cherry Chocolate Chip Energy Bites are for a quick breakfast, snack, or even dessert! And you know me, I love my energy bites! From these Peanut Butter Banana Energy Bites, to these Blueberry Almond Butter Energy Bites and those Mint Nutella Energy Bites, I’m always on the hunt for new flavor combinations. And these Cherry Chocolate Chip Energy Bites are no exception. Filled with dried cherries, mini chocolate chips, creamy almond butter, chia seeds, and honey, these cuties are flavorful, healthier, and delicious. Did I mention that they take just minutes to make? Since they’re no-bake, these cutie require minimal prep time and maybe just few minutes to chill in the fridge, if needed. Simply whisk the dry ingredient together, followed by the wet ingredients, and then combine the two. Shape the mixture into balls and your snack is ready to be devoured. Cherries and chocolate chips make the best combination, especially when paired with hearty oats, almond butter, and honey. These energy bites are perfect for those busy weekday mornings or as a tasty afternoon snack. So if your resolution (or in my case, goal) is to eat a bit healthier, these little bites were made for you. Easy to make and even better to devour, you’ll be making these over and over again! 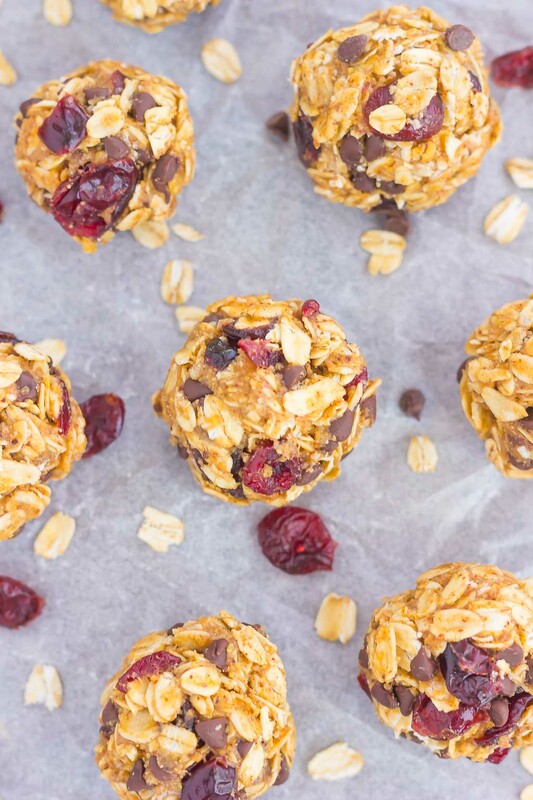 These Cherry Chocolate Chip Energy Bites are a simple, no-bake treat, filled with healthier ingredients and loaded with flavor. Perfect for a quick breakfast, snack, or even dessert, you'll be whipping up these bites all year long! 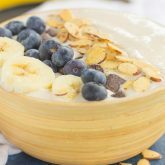 In a large bowl, combine the oats, dried cherries, chocolate chips, and chia seeds. Set aside. In a small, microwaveable bowl, add the almond butter and honey. Microwave for 15-20 seconds, or until almond butter melts slightly so that it is easier to stir. Let cool slightly, if needed. Remove from microwave and add in vanilla extract. Stir thoroughly until mixture is smooth. Pour almond butter mixture over oat mixture and stir to combine, ensuring all of the oats are covered. If the mixture seems too wet, add 1 tablespoon (or more) of oats, until it comes together. Place bowl into refrigerator and chill for 15-20 minutes so that mixture holds together and is easier to shape into balls. Once mixture is slightly firm, form into small balls. If mixture is too dry, add more honey to hold together. I can't believe how fast the year is going! Like, we are mid way through February already! I've been doing lots of reading (a goal of mine) so that has been awesome! 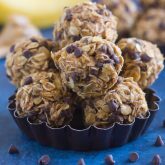 Love energy bites too and these look fabulous! Can't beat cherry and chocolate either! Pinned! Happy Monday! This year is definitely flying by so far...I'm ready for it to be spring and then it can slow down a little. Thanks for the energy bite love! Oh we are LOVING energy bites lately! My girls would go crazy the cherry chocolate combo! These are definitely kid-approved! Thanks! 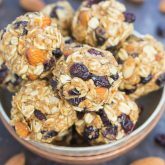 I love dried cherries and will definitely make these bites! So cute and I'm sure they taste delicious! 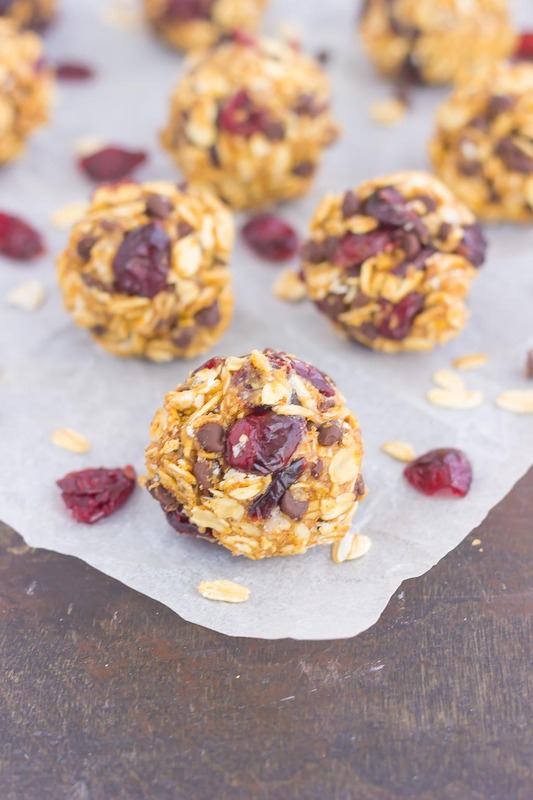 These energy bites would be SUCH a good post-workout snack to pack in my gym bag! Loving the combo of cherry and chocolate! My goals have been going fairly well, but life keeps throwing me curve balls lately so I'm getting off my game a little bit. :( I made a similar energy bite months ago and LOVED the flavors so much but haven't made them since. I might whip up a batch of these today! Thanks, Marcie! I whip these up all the time! 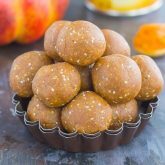 Love any kind of energy bites and this one I am saving to try next time. Thanks for the kind words and for stopping by, Kankana! Any nutrition info for these cherry/chocolate energy bites. Sure look yummy! Hi Jennifer! I don't have any nutritional information, but you could look this up using calculators online. Hope this helps! Thanks for stopping by!